Training | Southern Beekeepers Association Inc. 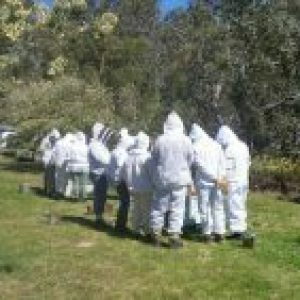 The Association holds beekeeper training courses each year – usually from August to October. Keep this date free for the 2018 SBA Beginner Beekeeping Course: Wednesday 29 August 2018 6 – 9pm followed by a weekend of theory and practical on 22/23 September 2018 9.30 – 4.30pm. Enrolments will be through this site and will open in April.. If this course is filled a second course will be run. A date will be published later. Course Fee: $250 This includes SBA membership for the year, The Australian Beekeeping Manual and access to handouts and member information and support. Becoming a beekeeper involves both cost and time. Expected costs during the first year may include a starter hive ($100), Beejacket, goatkid gloves, and smoker ($220), a hive tool at the training course ($10),and a 3-4 box Langstroth Beehive including Bottom Board, 4 Ideal Boxes, Lid and Frames ($190). Managing a beehive or two will require being available for inspecting the hive/ s every 3 weeks from Spring to Autumn each year. At times there is some winter work required but this is not as regular.